Time for part two of the Display Board project! 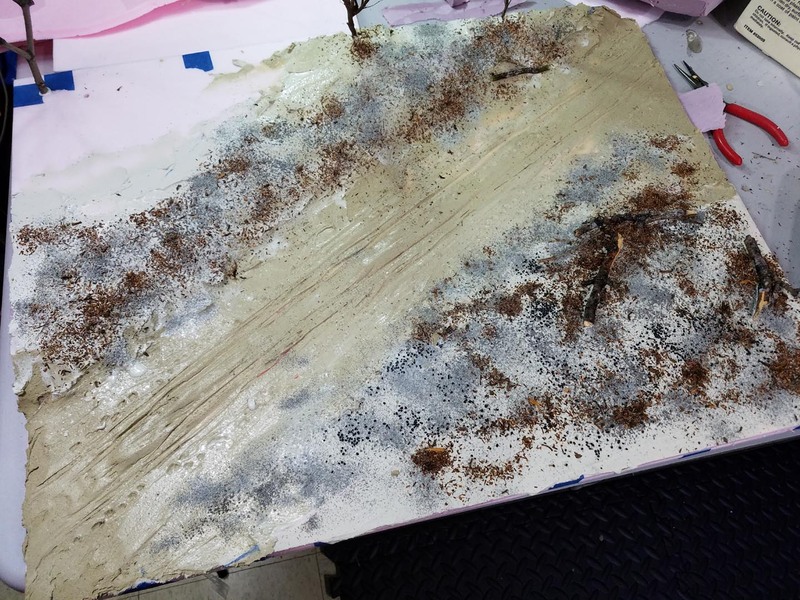 Once I had the board painted with the Badger Stynlrez primers, I could gather up my flocking supplies and get down to business. 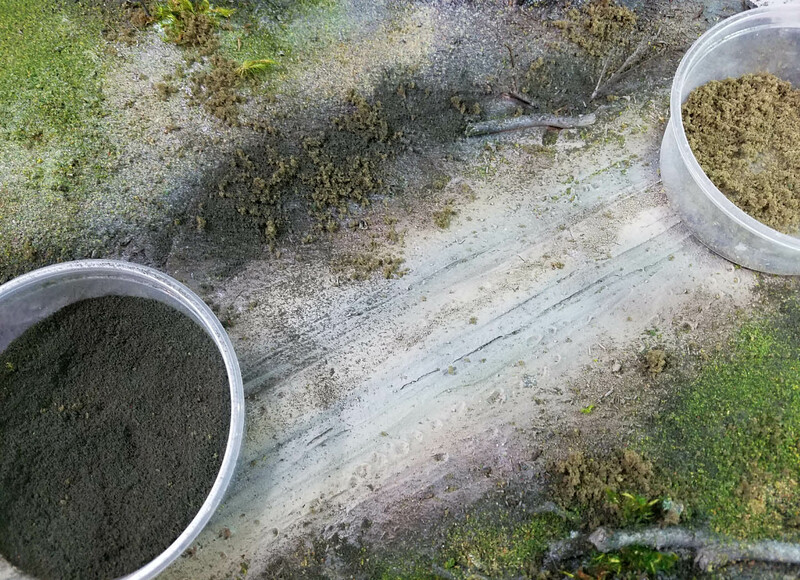 Not only do a I have a variety of colors on hand, but they are also different textures. You can see that the darkest flock is very fine, as that is used for shading. 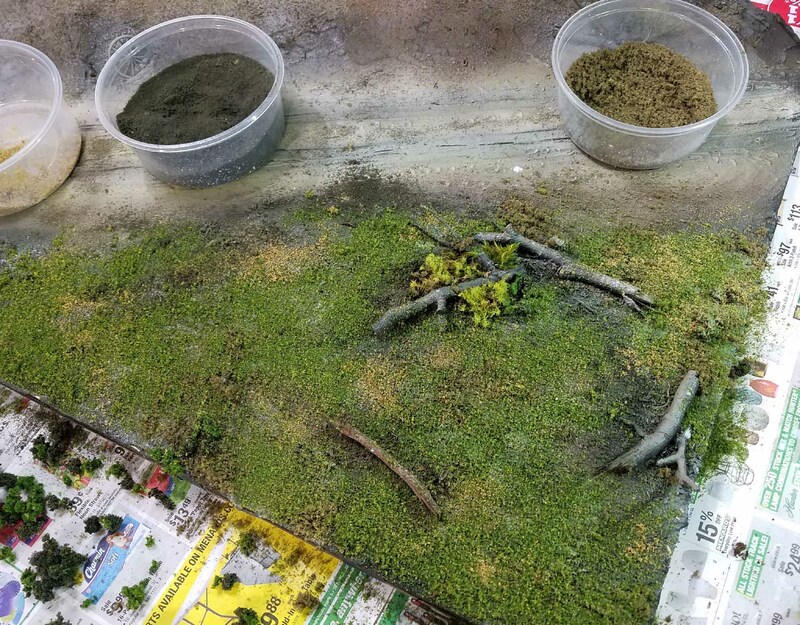 The brownish flock is a bit more coarse, and that will not only keep the board from getting too green, but provide a more practical ground cover texture. 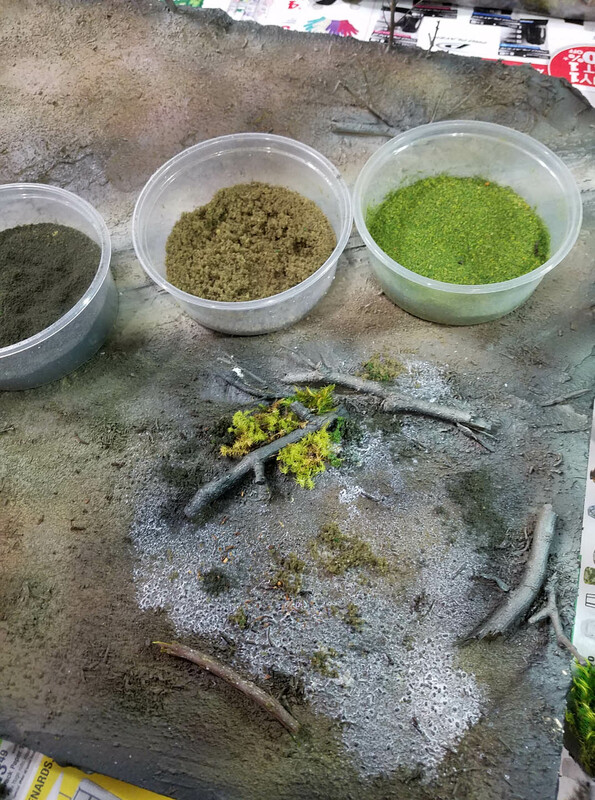 If I use static grass, or static grass tufts, it will make it that much harder to stand miniatures onto the board, which will be getting moved around quite a bit. 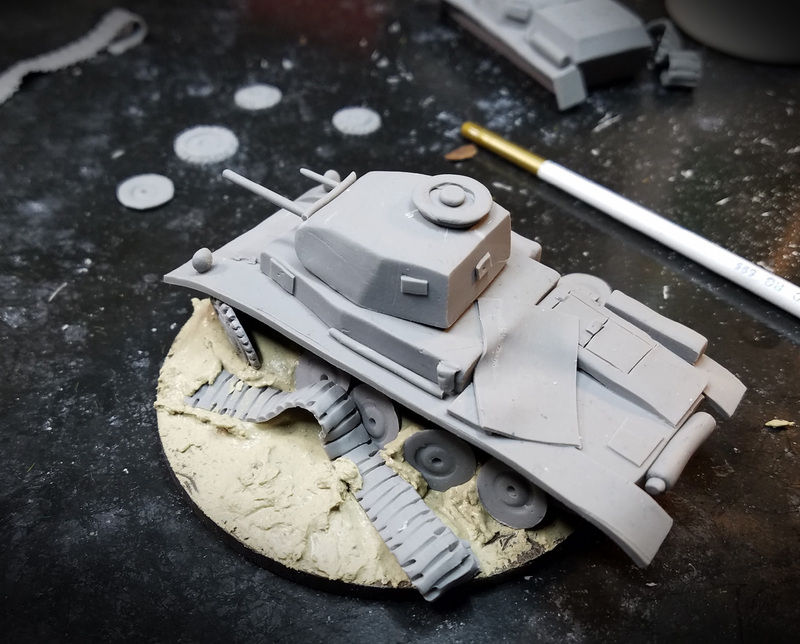 This is the kind of balancing act that not only happens on terrain, but even more so when doing display boards! I took wood glue and watered it down enough that I could spray it through this misting bottle... this mix will be used to hold the layers of flock in place. 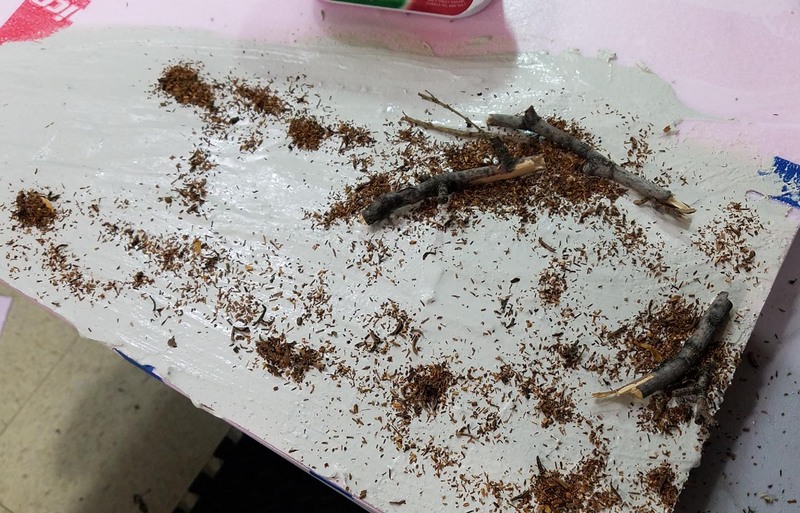 You can see that I began with the fine, darker flock in areas that I wanted to shade around the logs, and then began to place the brownish coarse flock in scattered batches. Once I had a decent amount of the coarse flock in place, it was time to add the green flock. I actually had 2 mixes of that flock. One was a pure green while the other had some fine tan flock mixed in. This would make a better transition from the coarse brown flock to a more pure green color without leaving clearly defined "zones" of color. 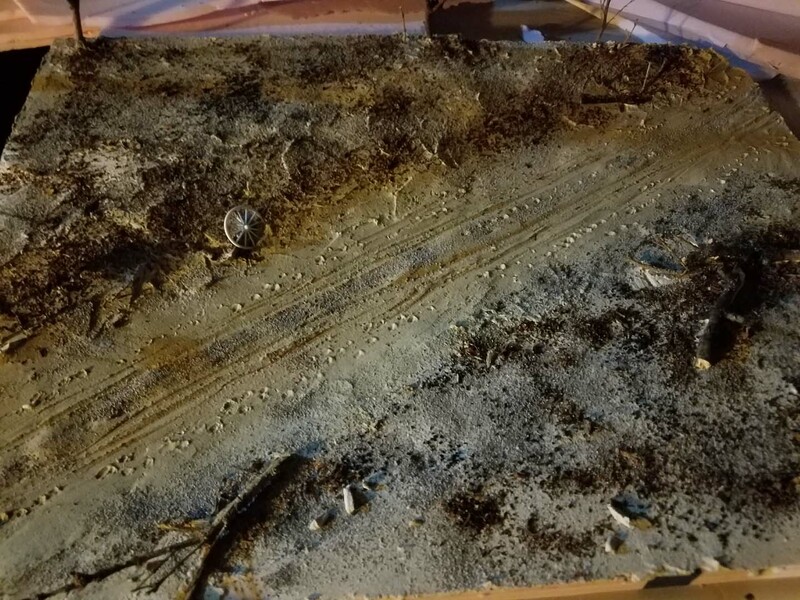 I have seen that on other terrain boards, and it can be a bit unnatural and jarring! Where the flock started to reach the sides of the road, I used more of the fine dark flock and the coarse brown. I figured that constant road traffic would either kill the grass near that edge or at least cover it with dried mud. Again, having a bright green edge on the sides of the road would be visually jarring. 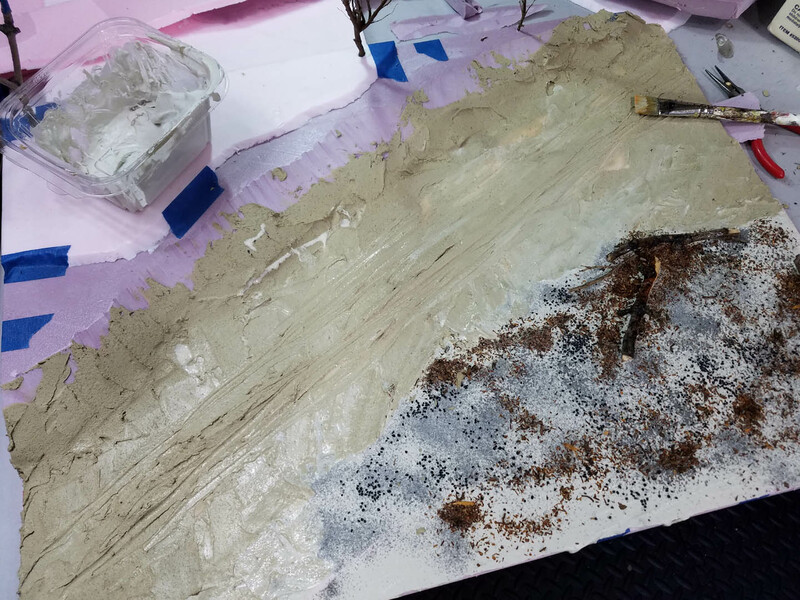 This view shows you what the completed side adds to the board in terms of texture and color. 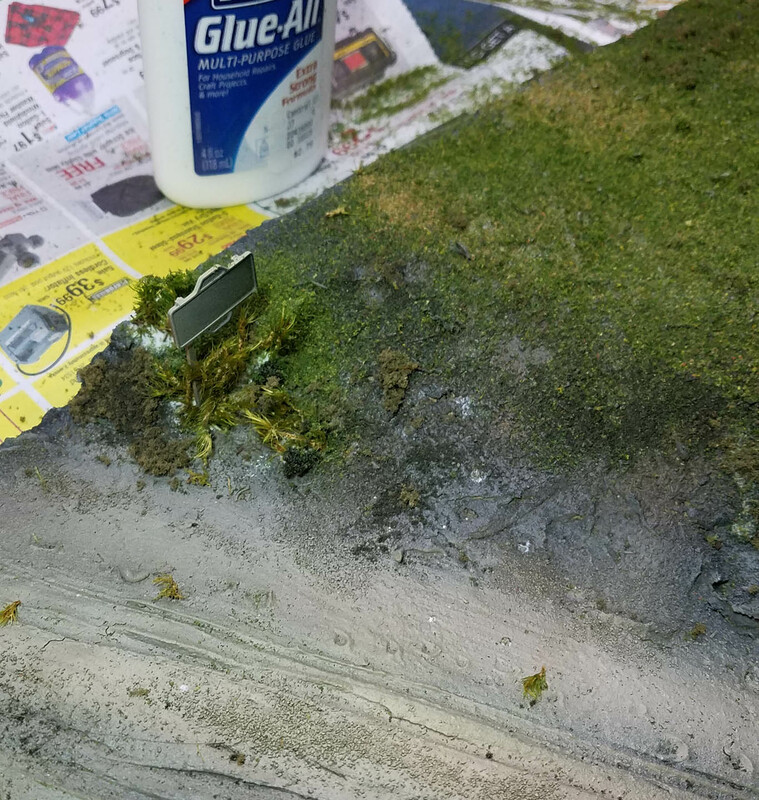 While it would be nice to have flowers, static grass and other touches, I have to keep in mind that at least 45-55% of this board will be completely covered with miniatures! Here's a better view of how I flocked the sides of the road. I had to make even more 'shadows' and coarse brown texture on this side, as the incline was 2-3 times taller than the other side. 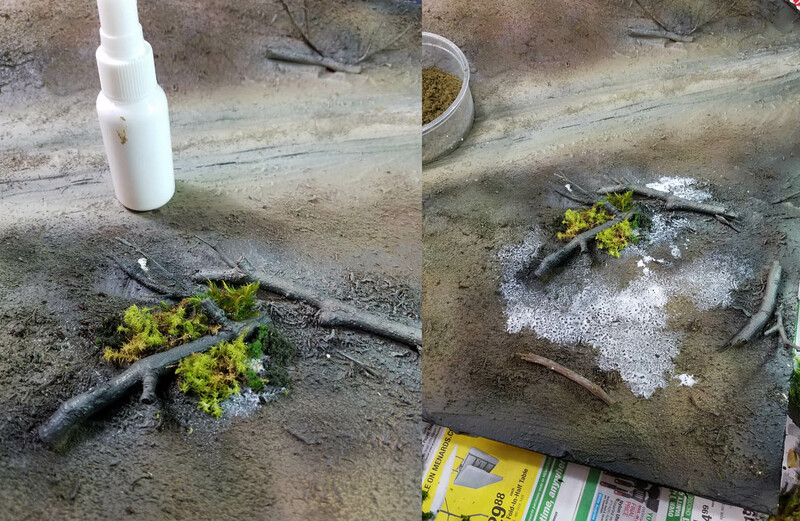 I used the same moss that I placed around the fallen trees to give more dimension to the road sign. That is a natural place for plants to spring up, and it also blended the sign into the landscape. Both sides of the road are complete, and I even have some smaller plants around the trunks of the trees. The last touch I will need to do with the flock is to have a little bit of it in between the ruts. 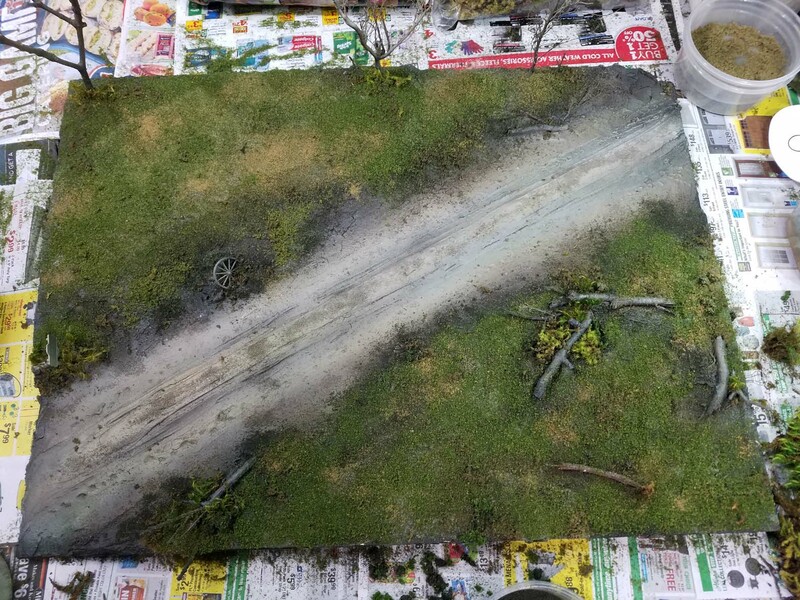 I wanted it to be a country road, not an autobon, so time for some glue and flock! 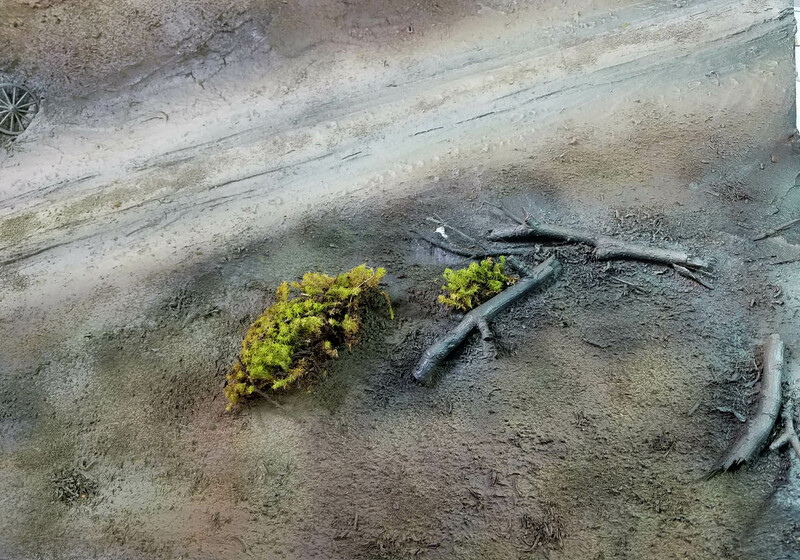 The final episode in the series will take you to the conclusion of the project, where I create some trees and get some water into the ruts for puddles! 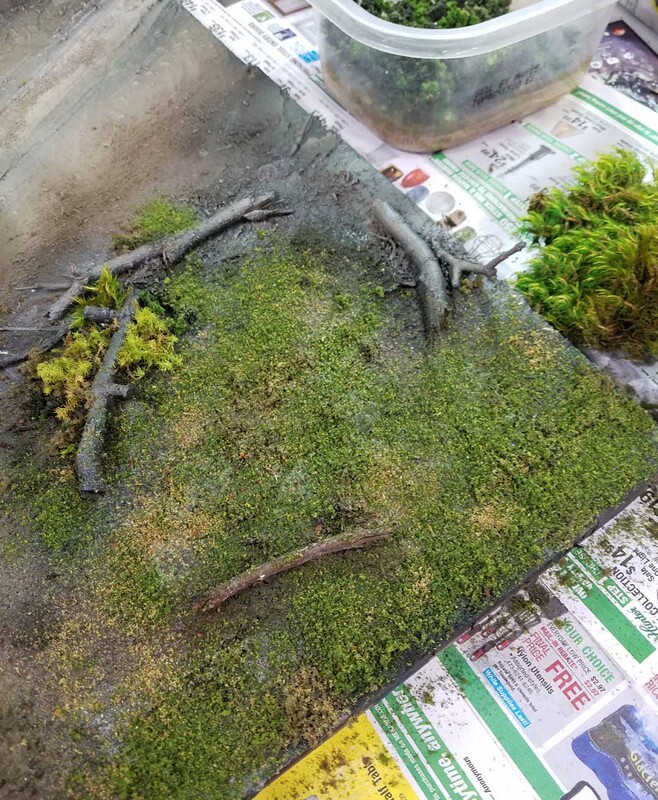 If it is possible to pledge any kind of support the Patreon Page, it will make it easier for me to create more tutorials such as this, and also make new terrain videos! 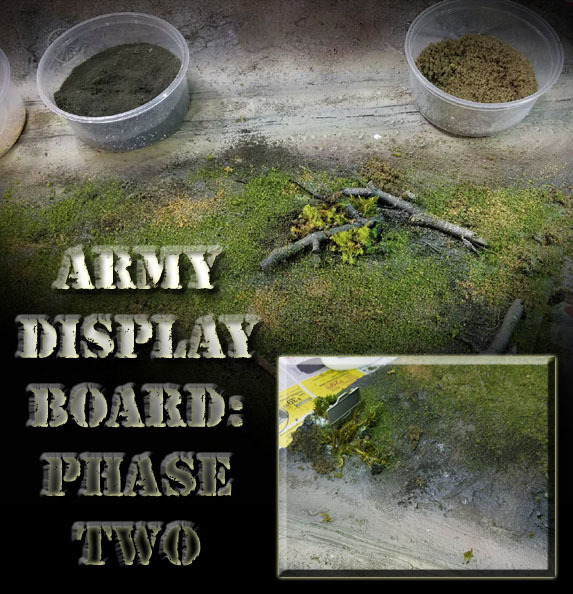 With the Little Wars Bolt Action tournament complete, it is time to get down to the army display board, and how I generated that in very rapid fashion, just like the objective markers! 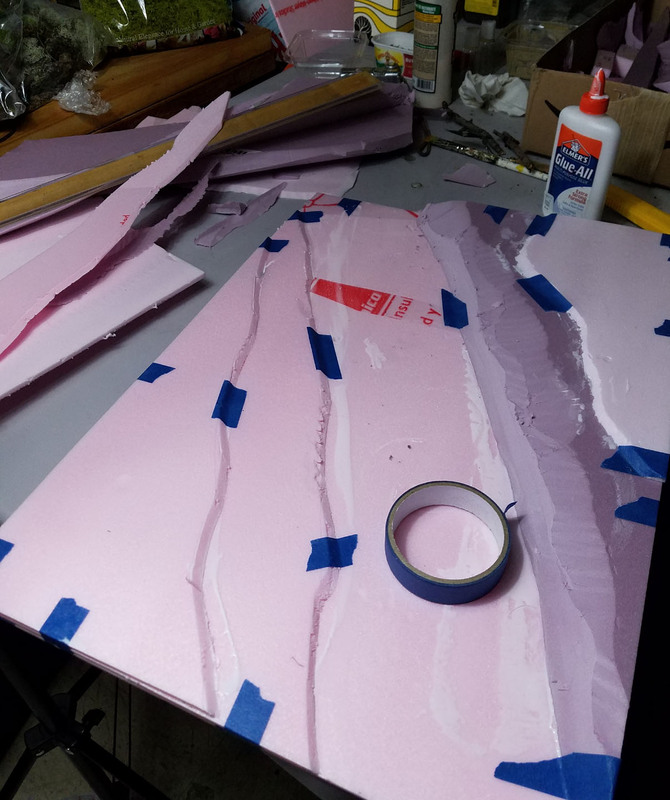 As always, I began with the thinner pink underlayment foam, along with a few bigger chunks of insulation foam left over from the Barbarossa board. This is why I save every scrap!! 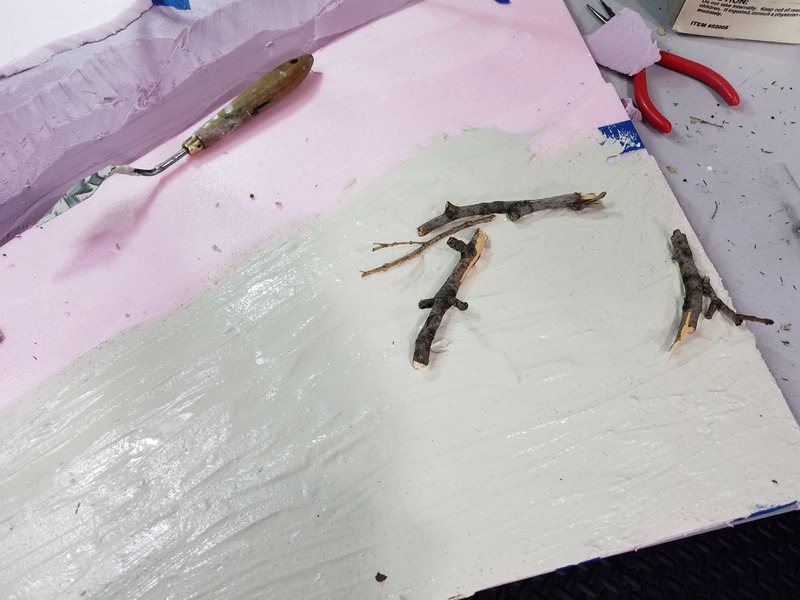 I used wood glue and Elmer's extra strong glue on those pieces, and used painter's tape to hold them in place. 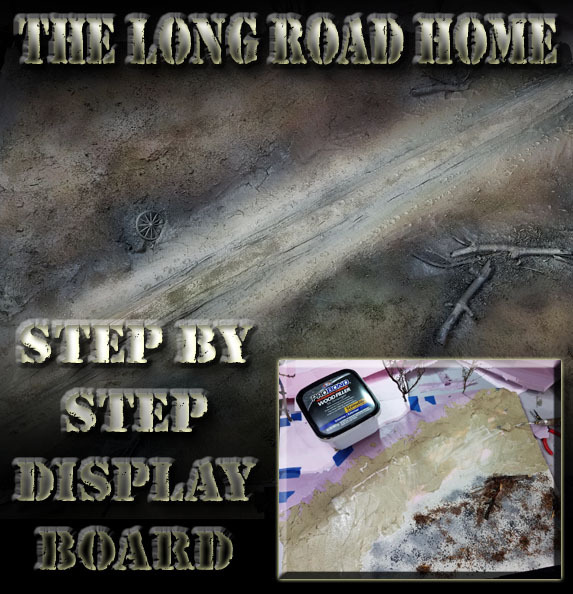 I started to use a glue/plaster mix during the Ardenne and Winter board projects, and that has worked well. In this case, I will also be combining it with wood filler. 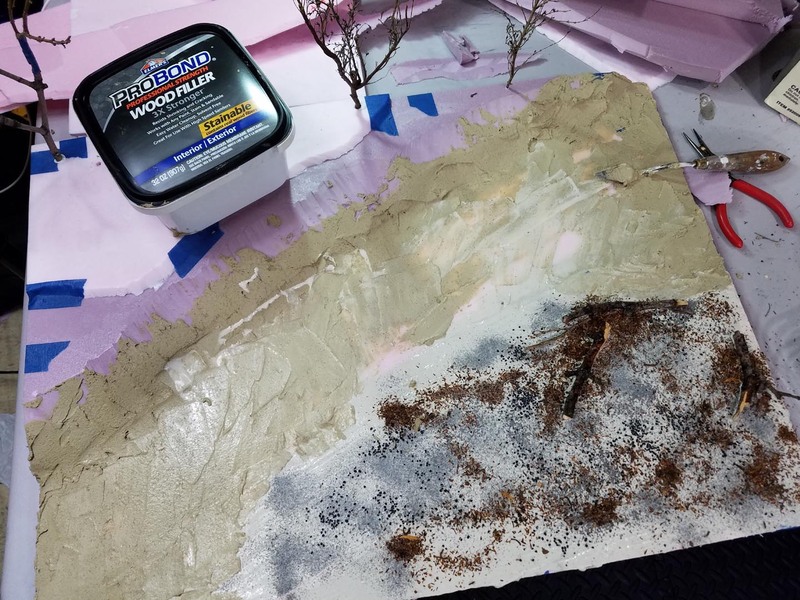 Since there is already glue in the mix, setting down some fallen trees with a few additional dabs of glue would have plenty of hold. 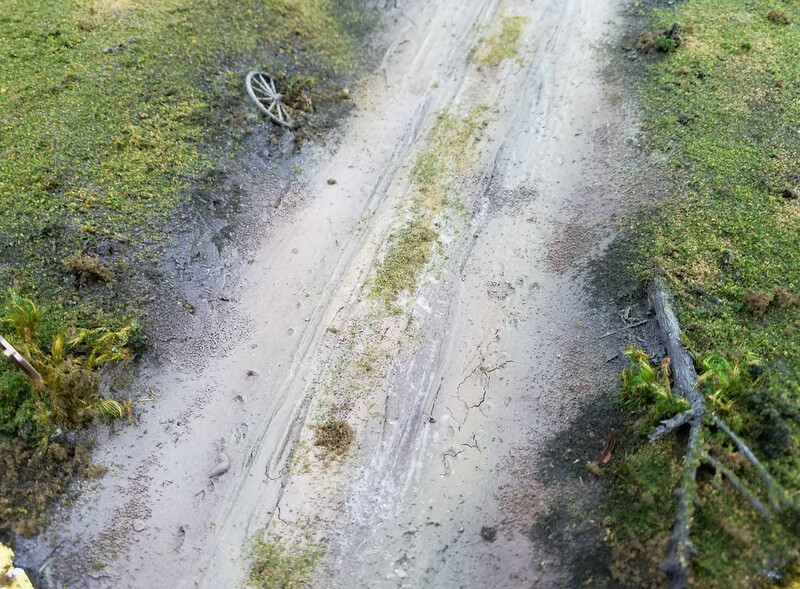 Just as I did on the road lengths, I made the track and tire marks through the wet filler with the 1 inch flat brush. 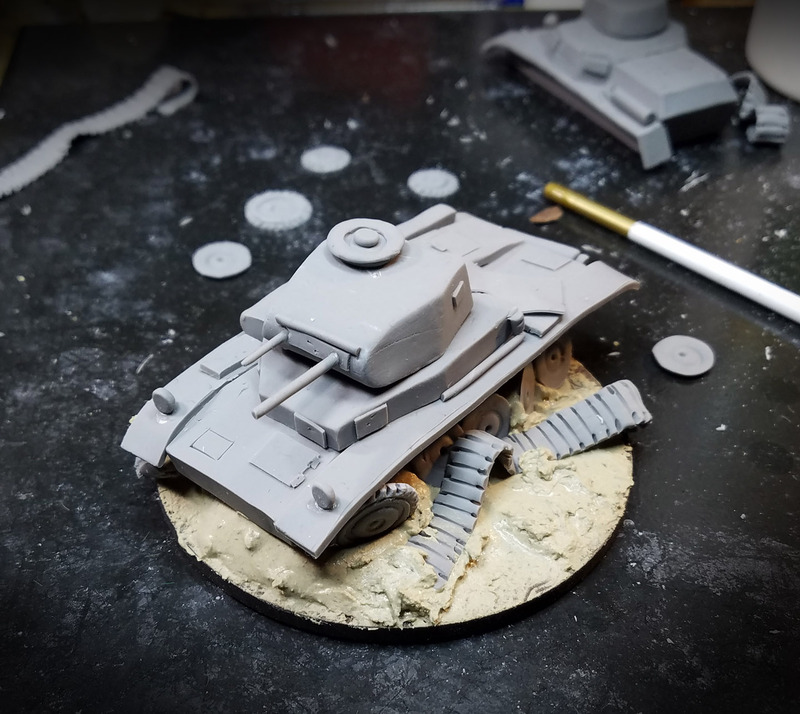 Once the road was in place (I was hoping that it would hold all the vehicles in the list PLUS the Citroen objective marker! ), I started to work on the opposite side of the road. There was more of an incline as well as more layers of foam to deal with on this side, so some of the wood filler was use to give it more "body" and strength. Huzzah! All of the landscaping is complete, and I also added a few trees. 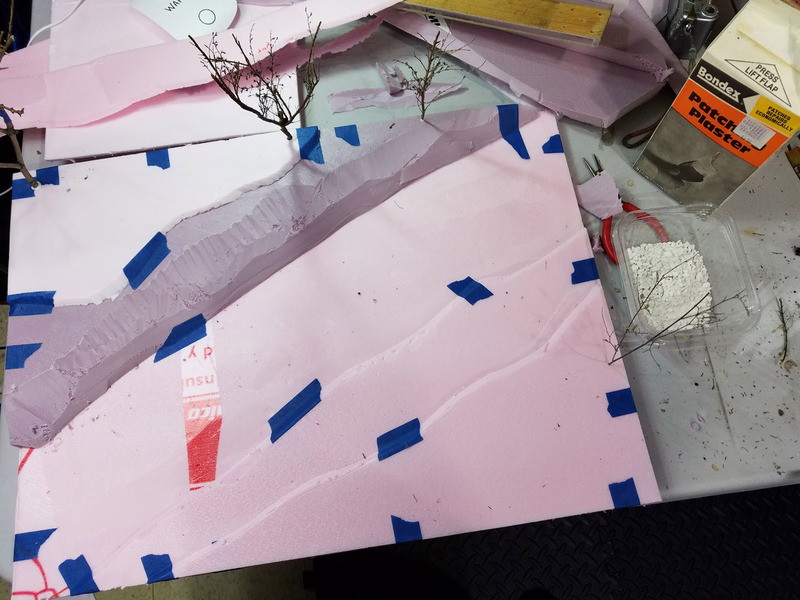 I have a number of articles on how I use regular tree branches to make all sorts of trees. 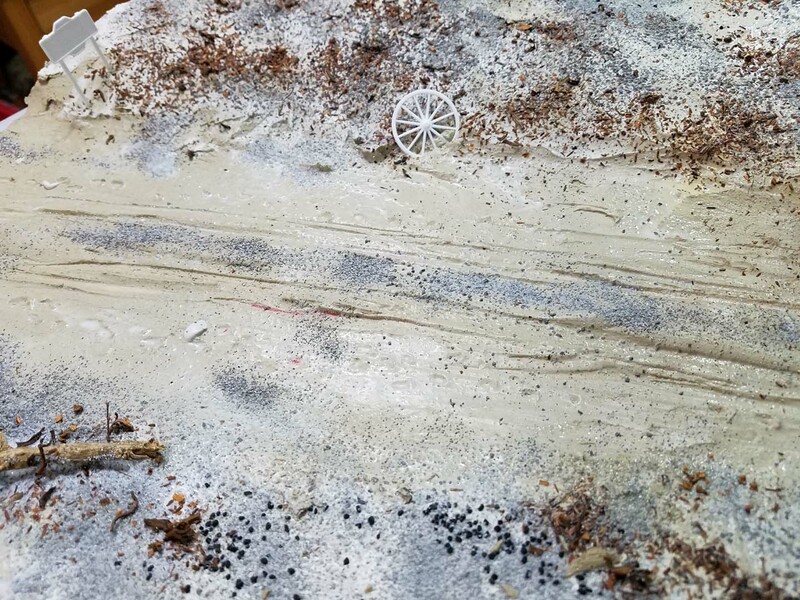 I remembered that I had a set of 1/48 scale road signs, poles and cart wheels, and I thought those would be a nice touch to add in a hurry! 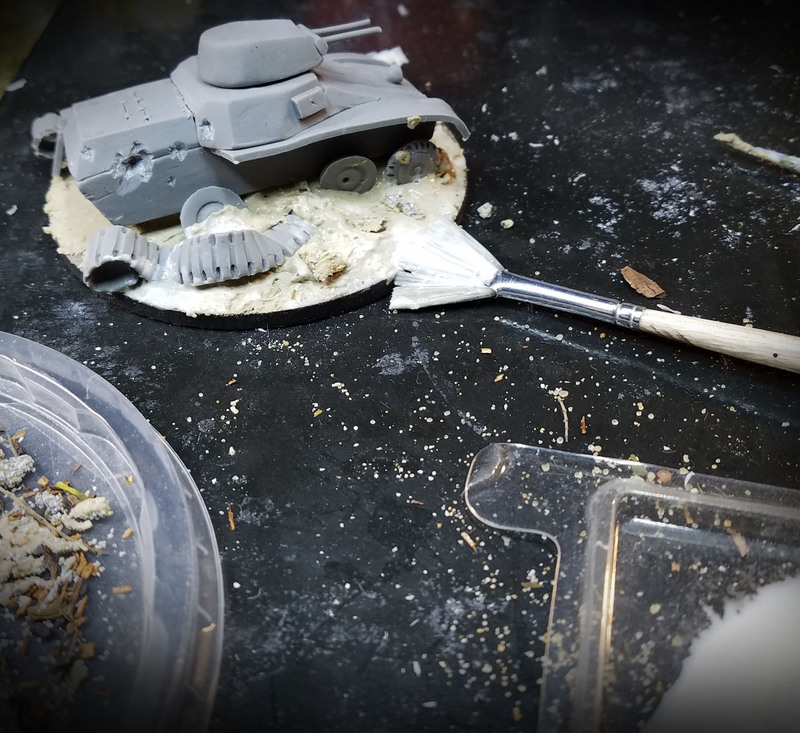 I grabbed whatever was at hand to make footprints in the mud, since it was possible that some of the troops might have to be walking along the same one as the vehicles. It would also provide more of a human element to the board. 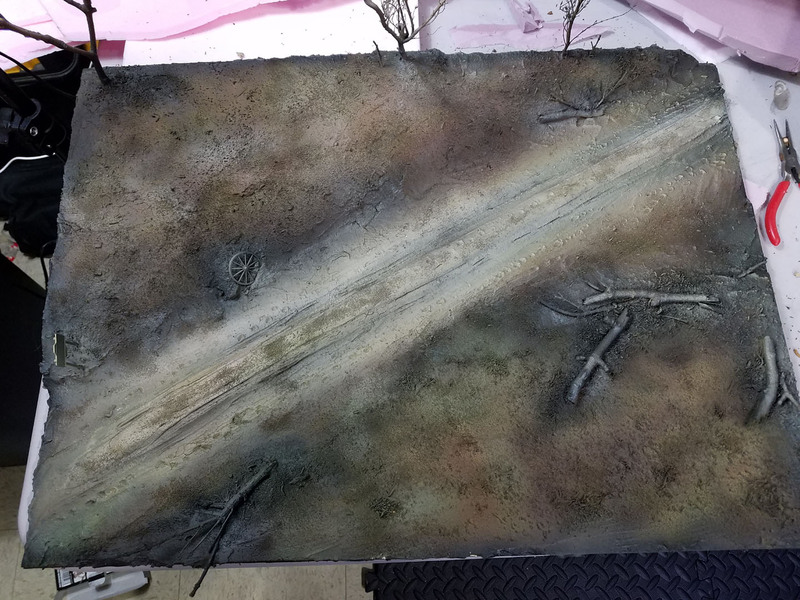 With a few light layers of sand over the board and on the center of the road, it was time to let this dry and set. When I turned off most of the lights, I was greeted with this panorama! I thought I would take an image which really displayed all the textures involved. 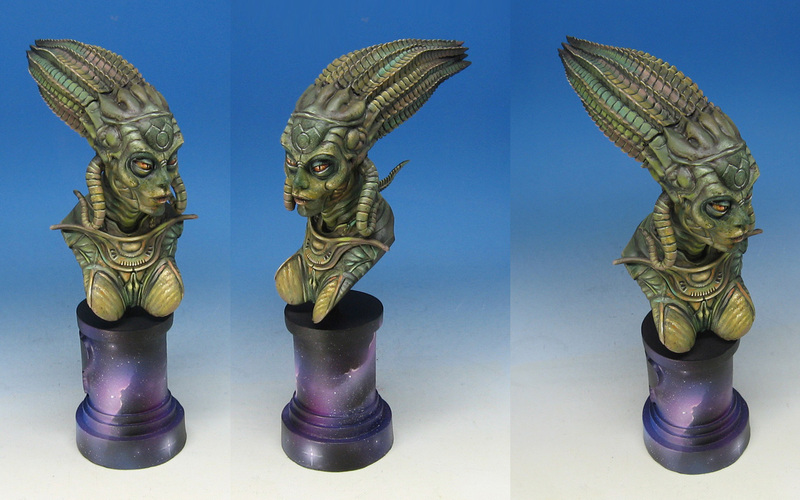 Once that was set, I took the Badger Stynlrez primers and quickly airbrushed some color onto the board. 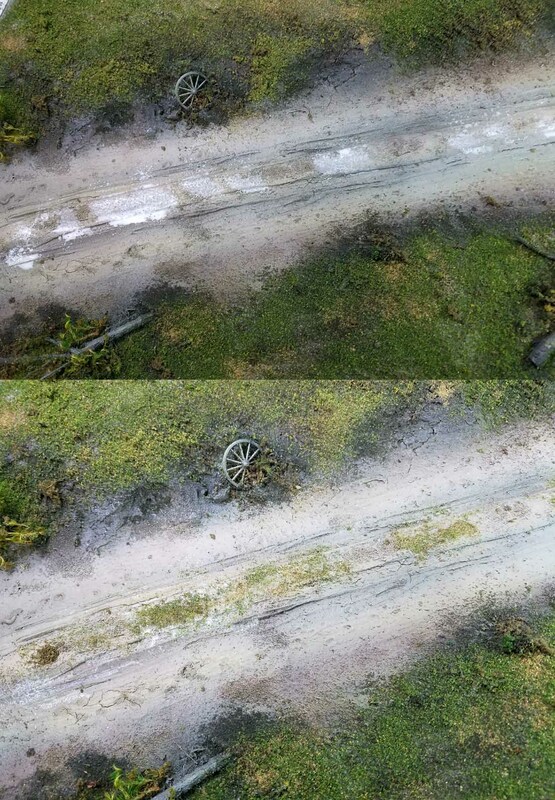 You can see that I made the mud a bit lighter. 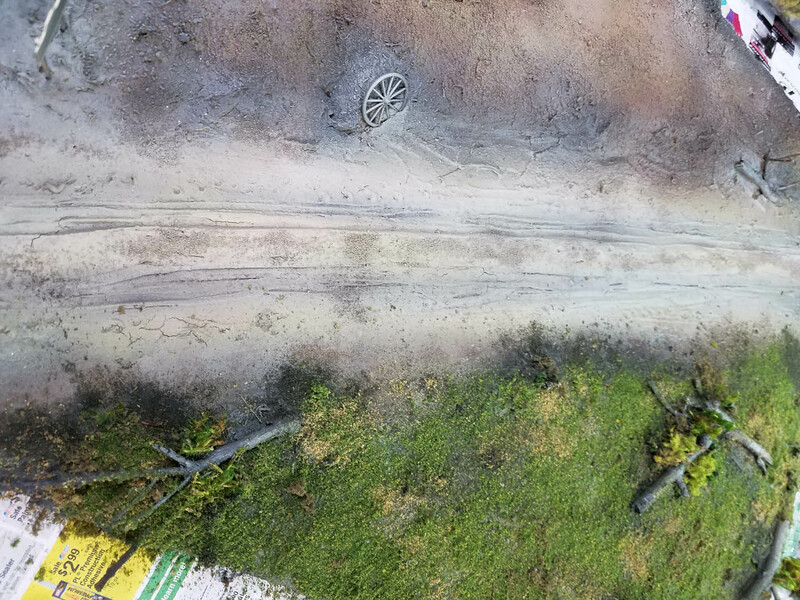 This is to offset the vehicles, which will cast a lot of shadows, and to allow the darker water stains in the ruts to show more too. 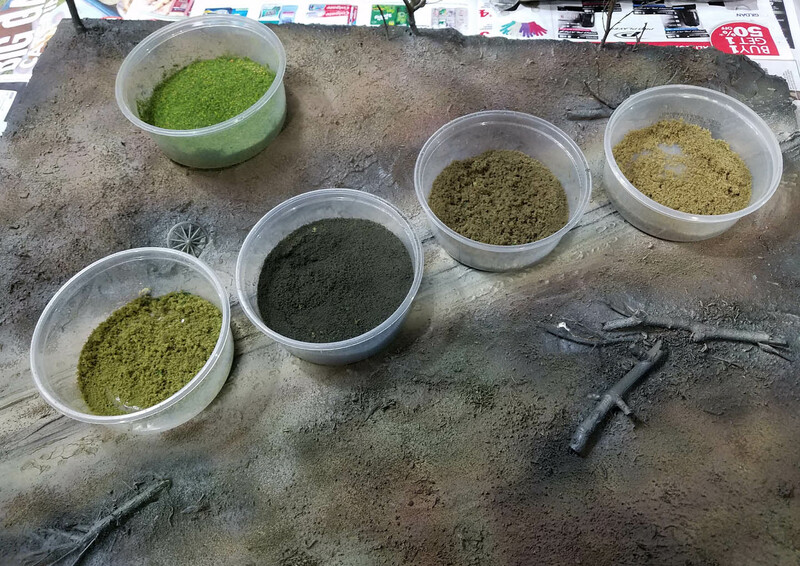 Knowing that the next few layers of color would be my greenish flock, I wanted to build up enough browns to make the green flock seem as if it really was growing out of dirt! 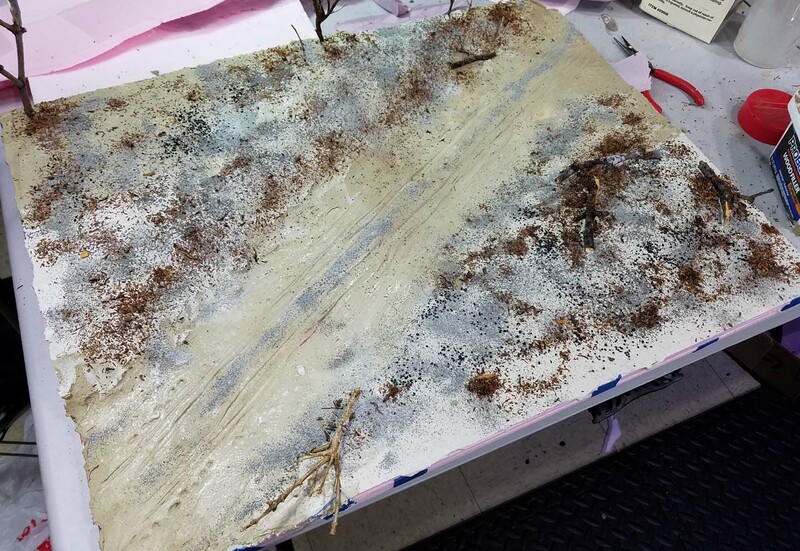 Stay tuned for the next episode, where you will see the flocking process and the water added to the ruts! If you can support these kinds of tutorials on my Patreon Page, that would be very helpful! Some new texture rollers have just been added to my Green Stuff World collection! 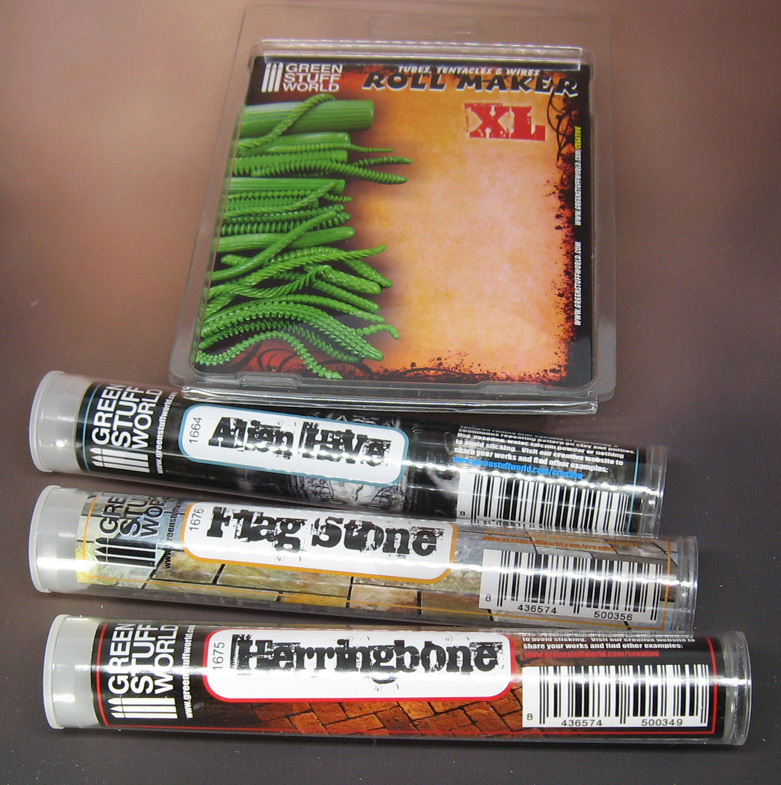 The Flagstone, Herringbone and Alien Hive will be fantastic additions, as well as this new version of the Roll Maker!! I can certainly envision combining the Roll Maker with the Alien Hive texture, along with my existing sci-fi style rollers. Here's a better look at the textures. As always, there's a lot of patterns tucked into one roller, so there are no "plain" spots. This is especially important when using sheets of Sculpey as I do, which are subsequently baked. Onto the rolling! 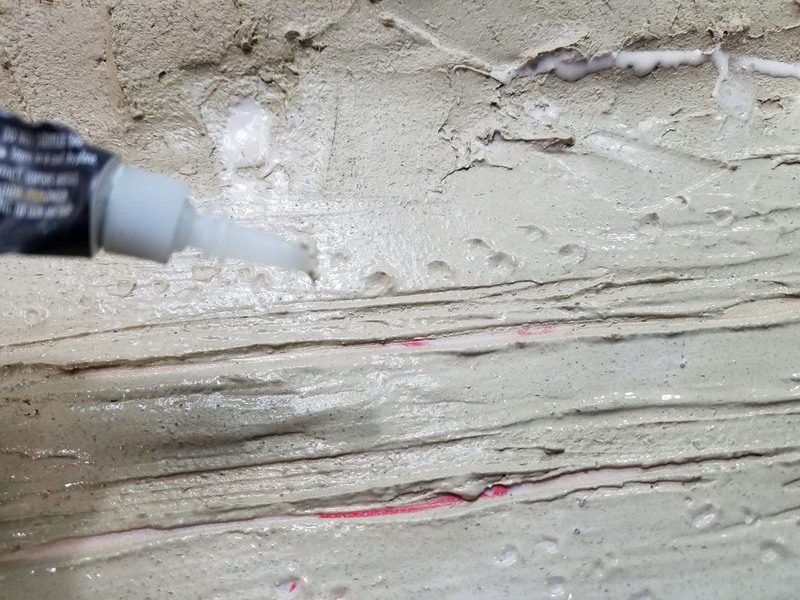 Using the Gray Extra Firm Sculpey and the plain roller, I started to form a quick sheet to see which thickness might work best with the Flagstone texture roller. 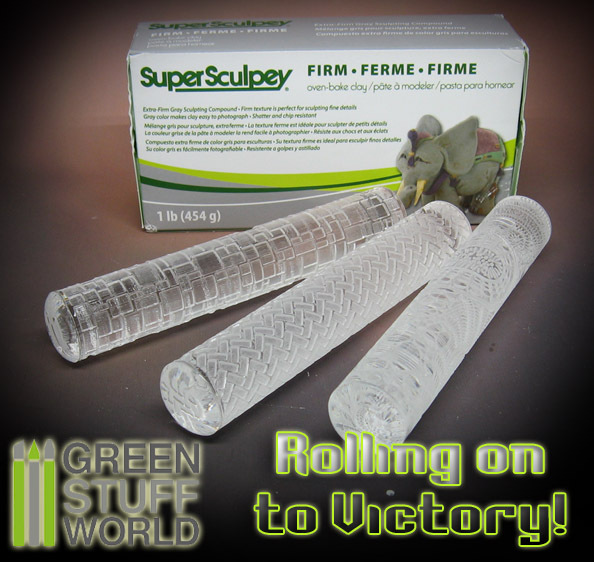 You can get the Sculpey at any Hobby Lobby or Michales craft store, and even on the Green Stuff World webstore if you are overseas. 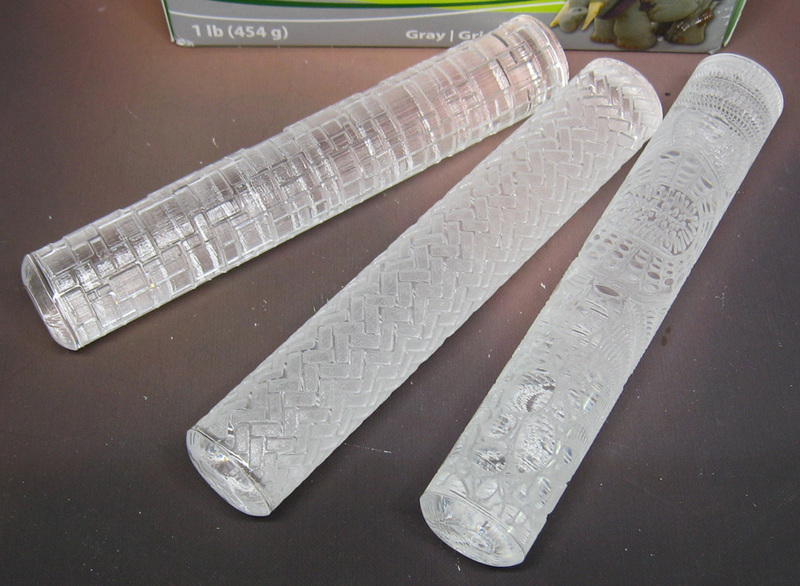 Green Stuff World also has 3 roller guides, each one as a different thickness. These are incredibly helpful, and I use them all the time. It can be very difficult to keep the same pressure on each side of the roller, even more so when you are creating the large sheets which you will see later in the article. 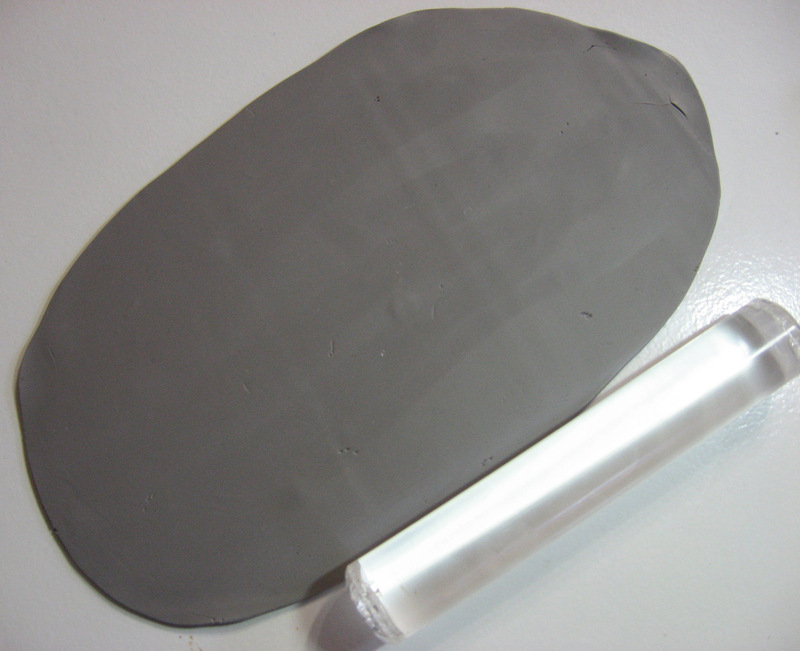 This Extra Firm Gray Sculpey is the one type of clay that does not get itself stuck into all the tiny crevices of the rollers. 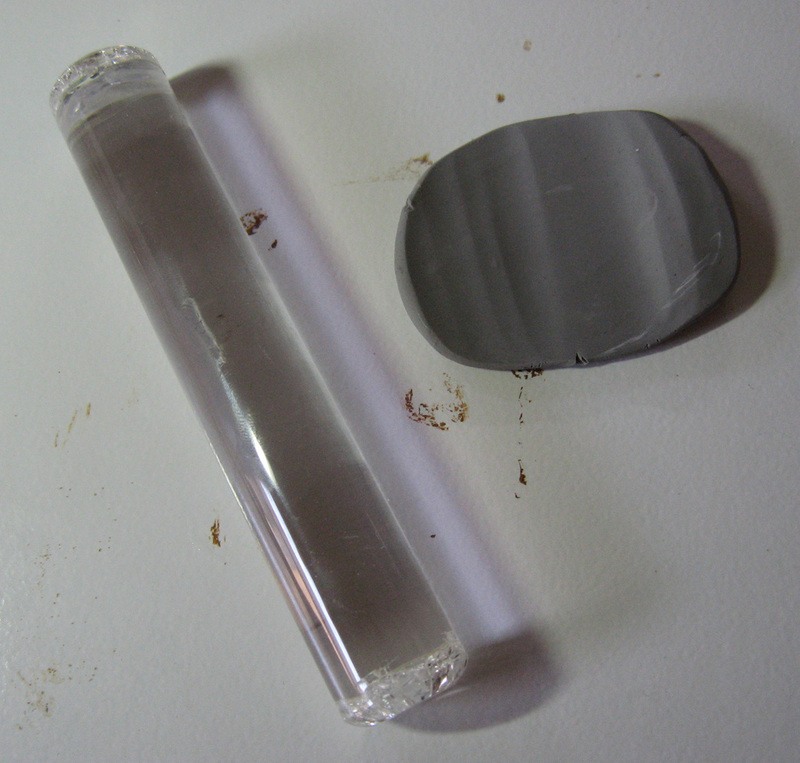 It is a much stronger clay, but you can still break it and carve it like the lighter versions. I usually avoid the Super Sculpey version, as that is more brittle, and can also turn out rubbery. The Herringbone pattern is great as well. My first thought was to use it as a cobblestone road, but it might also do well as exterior wall texture for medieval structures. Definitely something to try out! When I learned of the Bolt Action tournament at Little Wars just a few weeks ago, that set off a scramble to prepare. The army was painted, but I didn't have a display board, nor did I have objective markers. 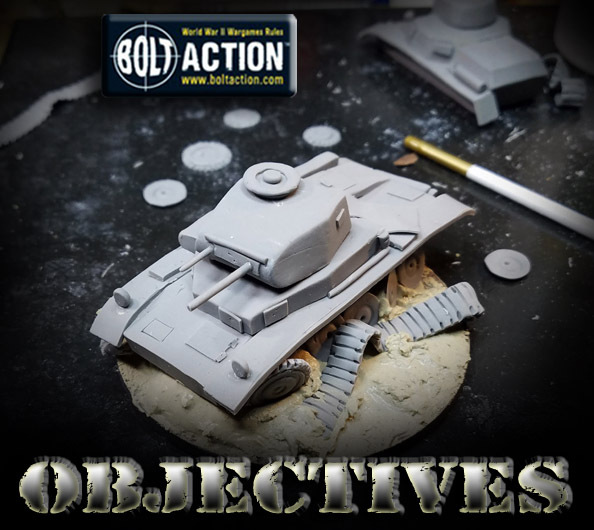 While I am not sure if they are actually needed, I figured that have the standard 3 objectives on hand might be a wise precaution. One of them is already set, but I needed 2 more that could cover a few different aspects. 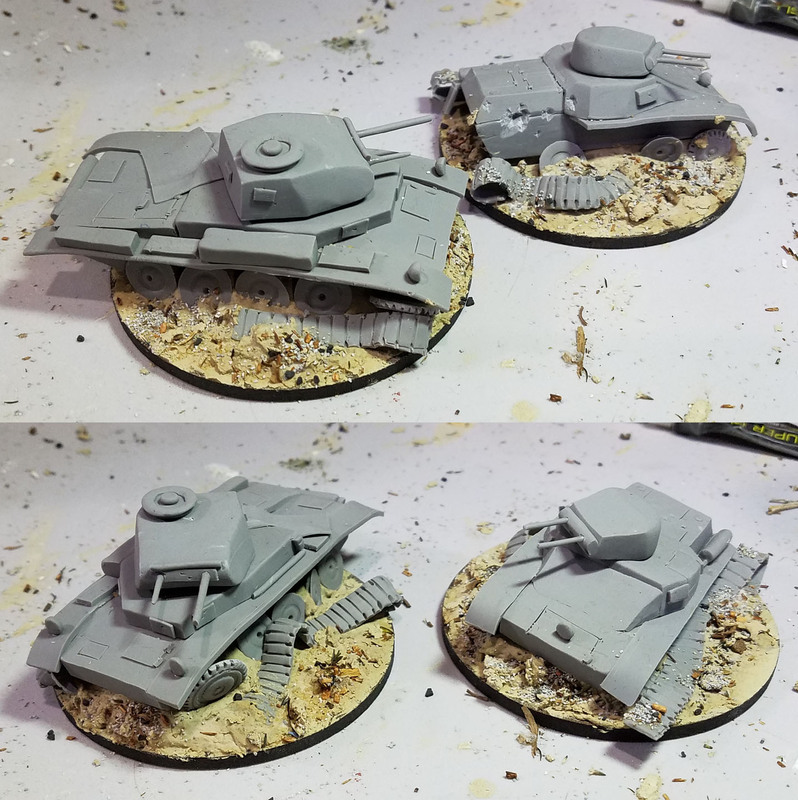 They needed to fit my early war "what if" French army, but later on I wanted them to be potential terrain pieces which could work for both France 1940 and for our Barbarossa campaign. 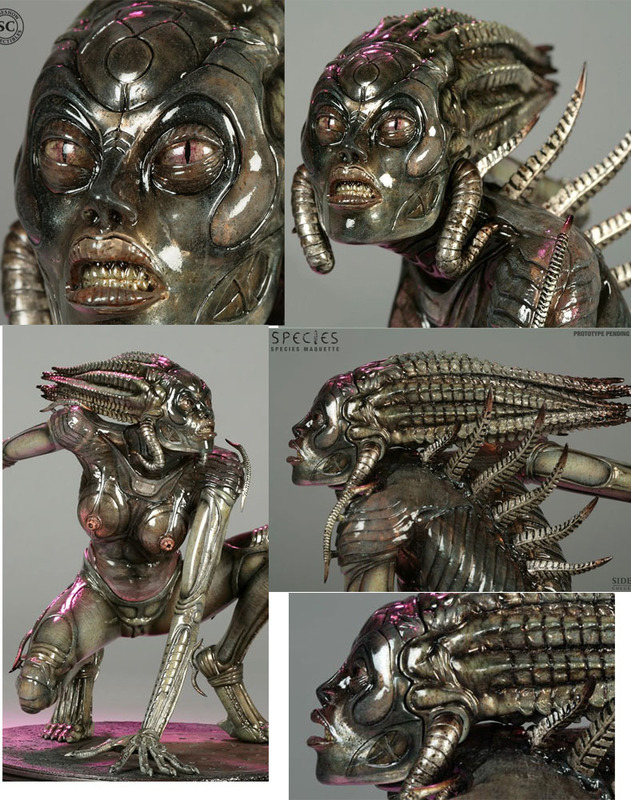 This meant breaking out the extra firm Gray Sculpey, and seeing if I could get these sculpted, baked and based in a mere 2 hours!!! 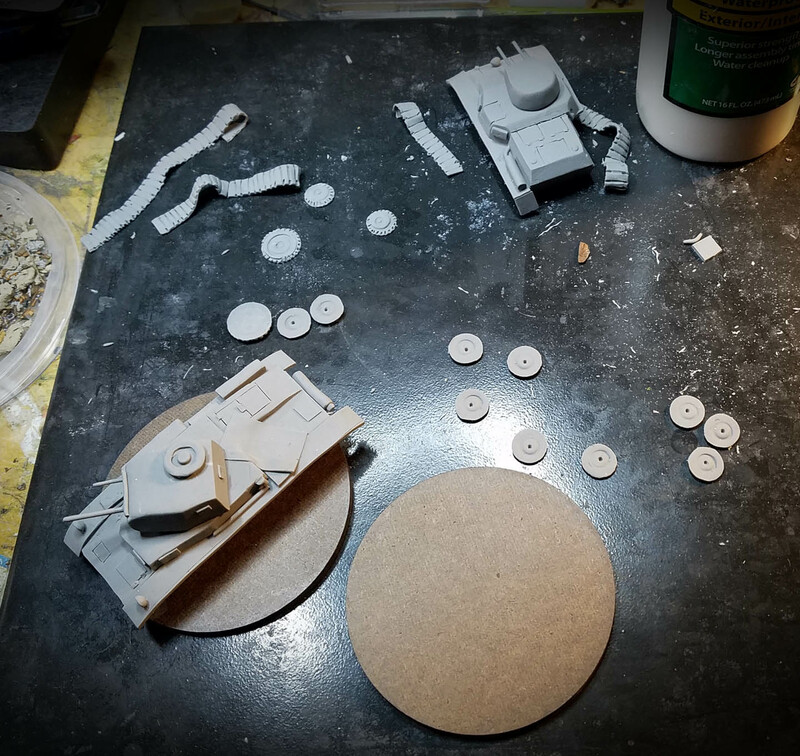 The hulls of the Panzer 1 and 2 were a more simple task to create, but the wheel and track assemblies are always much tougher to construct. 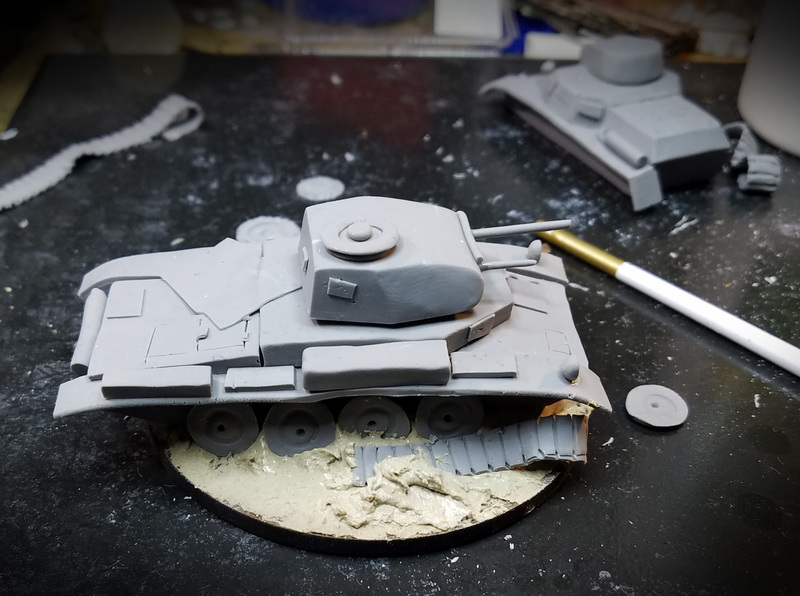 I had to save major time, and after reading a book series called PanzerWreks, I discovered that burned out tanks had a tendency to end up on their belly armor buried in the dirt/mud. This is due to the rubber on the drive wheels burning off, but more importantly the tortion bars melting. Once this happened, the weight of the vehicle made the remaining hull sink to the ground. This was perfect, since it meant that I could set the hulls into the wood filler, as well as the scattered drive wheels and sprockets. I could also make some very quick and easy folded track lengths, and bury those too! This alone saved hours of painstaking work on something that was "destroyed". Yet another reason I did not want to spend very long on this project! 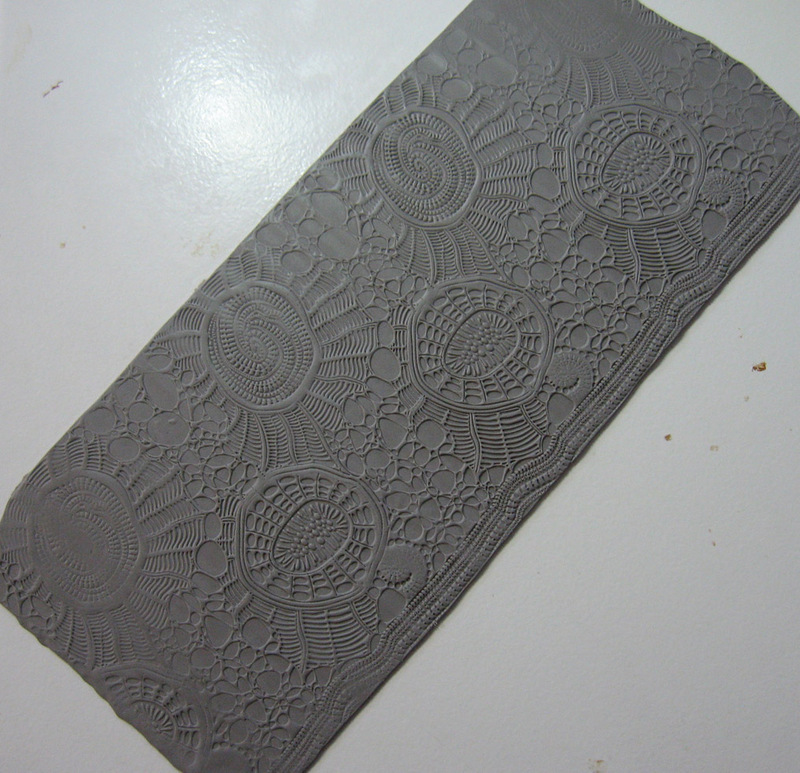 I used my clay extruder/pasta machine to create metal 'plates', which I could cut up with the exacto knife and turn into hatches, hinges, viewports and so on. 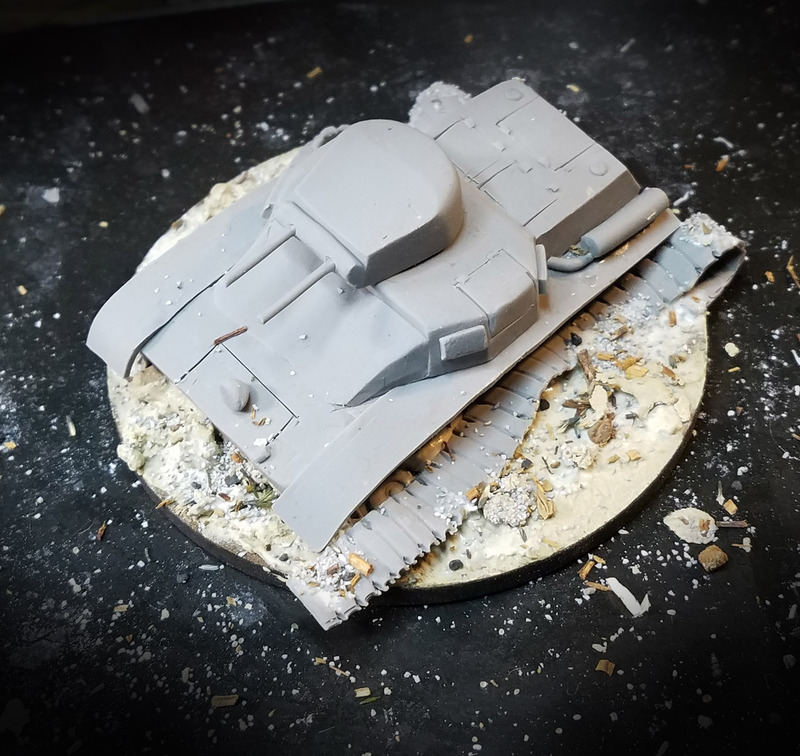 I was hoping to keep the hulls intact so that I might even be able to make temporary "complete" wheel/track assemblies in case I needed a working tank, but this part of the vehicle is simple enough to sculpt that I could make more in a pinch. 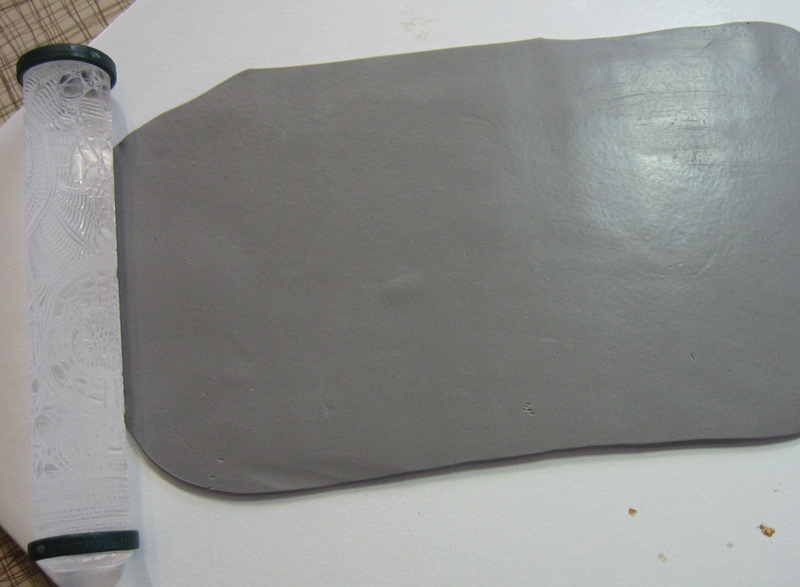 It is mostly a matter of creating 'blocks' of the Sculpey clay, and cutting away at it to get the desired shapes. 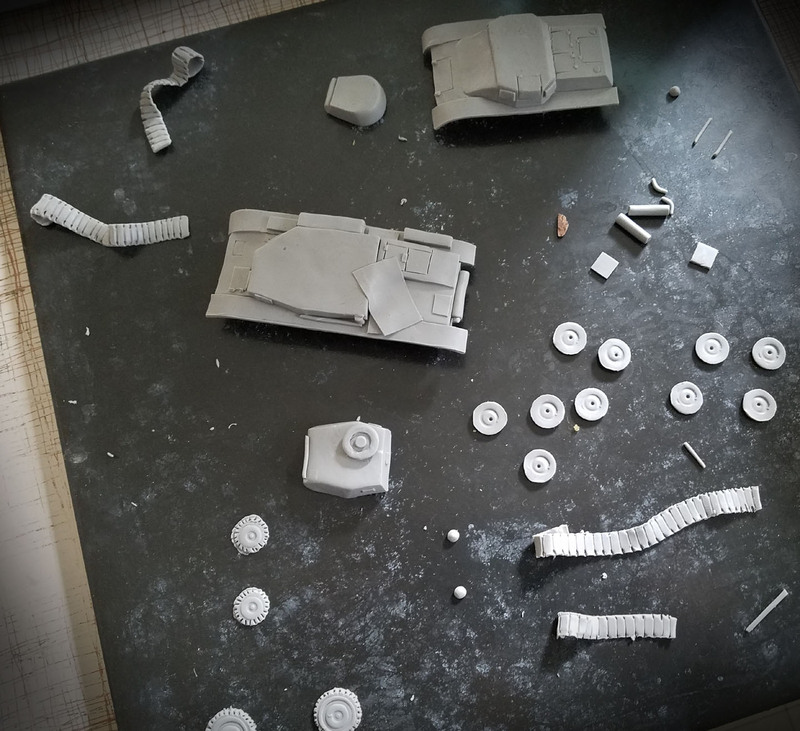 Once the pieces were set into place, I added some more wood glue to cover up bits of the tracks, as well as provide a little more 'grip' for the shattered wheel assemblies. It was pretty funny to see them sitting at such odd angles, but after looking at dozens of images of wrecks, this is fairly common. 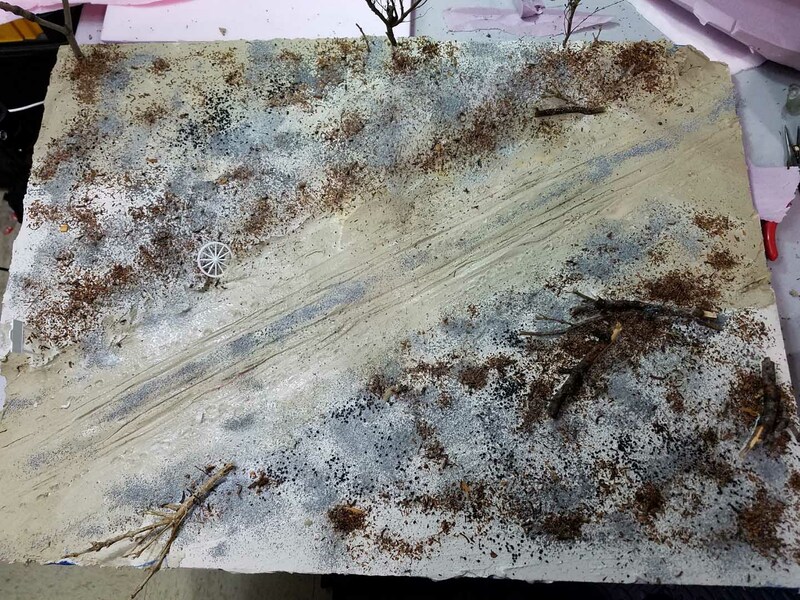 I had a collection of debris from my previous terrain projects (the roads and display board), which made some very nice large rocks and other scatter bits. The original bases were going to be larger, so that I could potentially have miniatures standing on them, but space on the display board is at a premium. Also, this is a lot closer to the normal recommended size of Bolt Action objective markers. 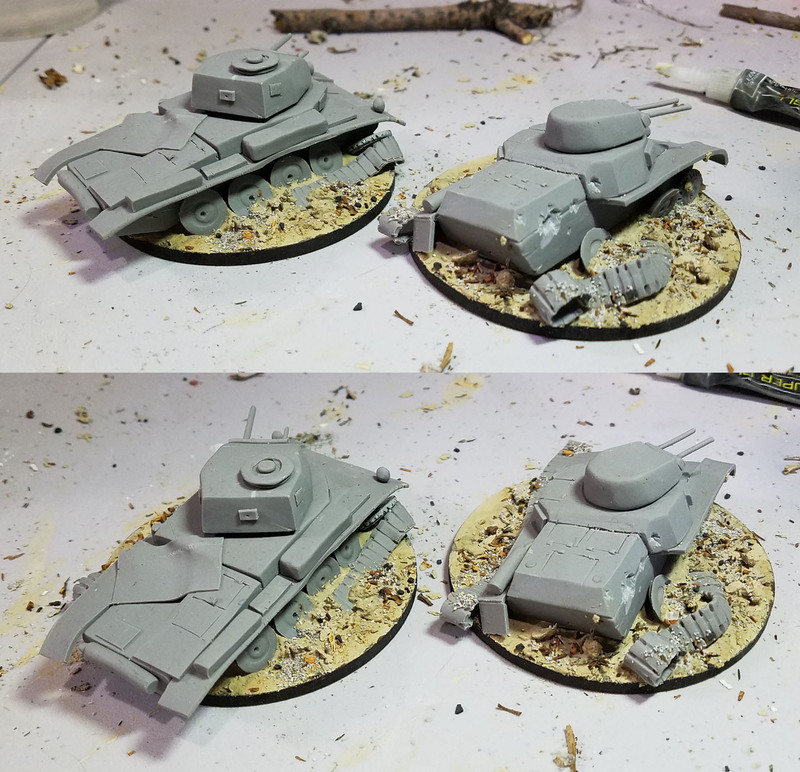 These have already been primed, and I will try to paint them in some form of video tutorial. It might be a facebook live, or an instagram live. Not quite sure yet!! 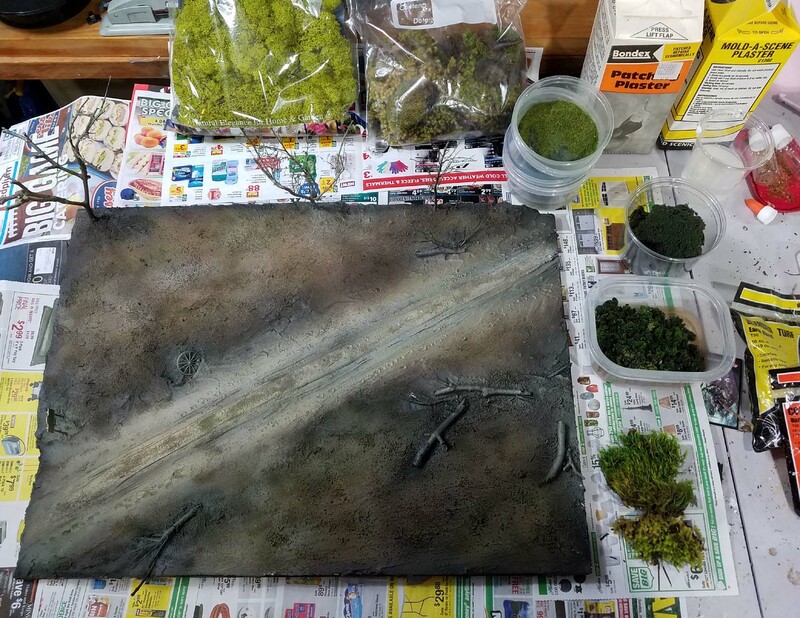 As always, any support on my Patreon Page makes it easier to create how to articles such as these, terrain making videos, painting videos, and so on. It is a lot of fun to do them, but they also add a lot of extra work to every project. 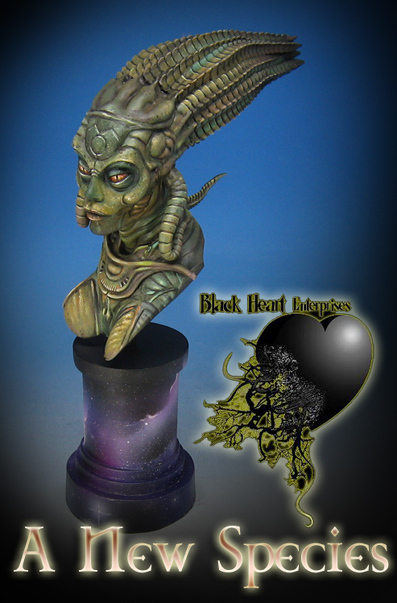 Here's a few shots from the Black Heart Models bust that I painted during a live session last week. While I could not follow these reference pics exactly, they were a handy guide. I might still try to do the lacquered effect on the skin, but I have to make sure everything is completely dry. 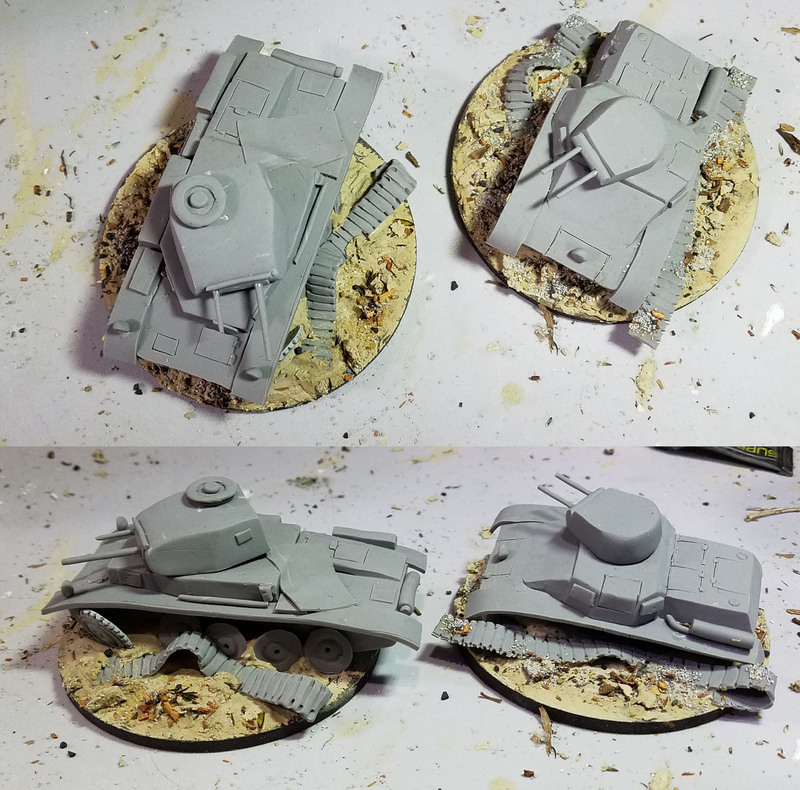 I used a Badger airbrush on the pedestal base, starting out with light primer colors, and then going over the top of those with a few of the Ghost Tints. You can see that I emphasized the blue and magenta, as I thought this might be a perfect compliment to all of the greens and tans of the bust. 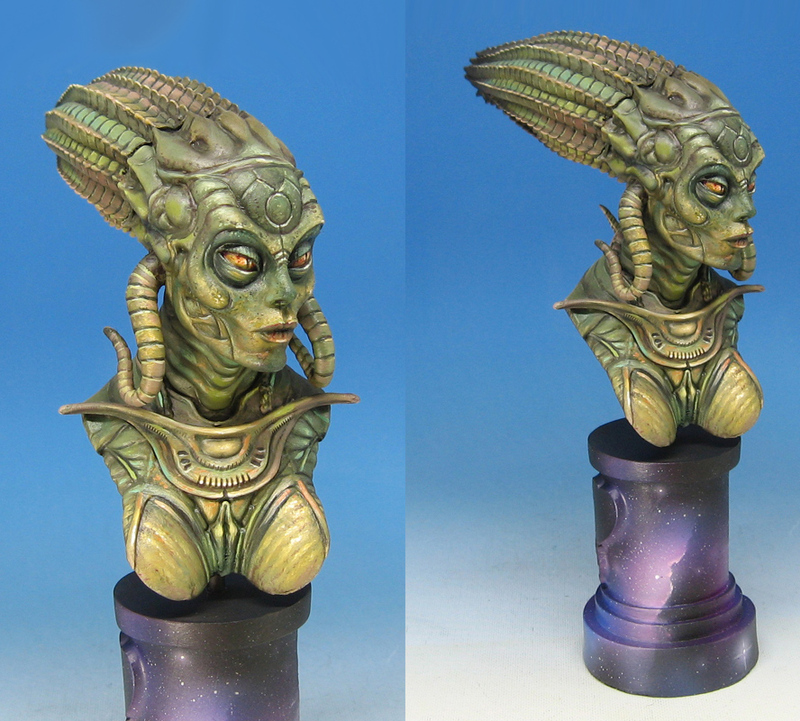 It was a tricky balance, since the colors on the bust were somewhat muted. There are some areas that have a deep blue green or dark red, but those are in specifically designated areas. Using Pthalo Green and Quinadridone Magenta really added some extra punch, very similar to what I do with the Reaper Clear and Liner paints. I had been waiting a long time to test out these brighter and more intense tones. 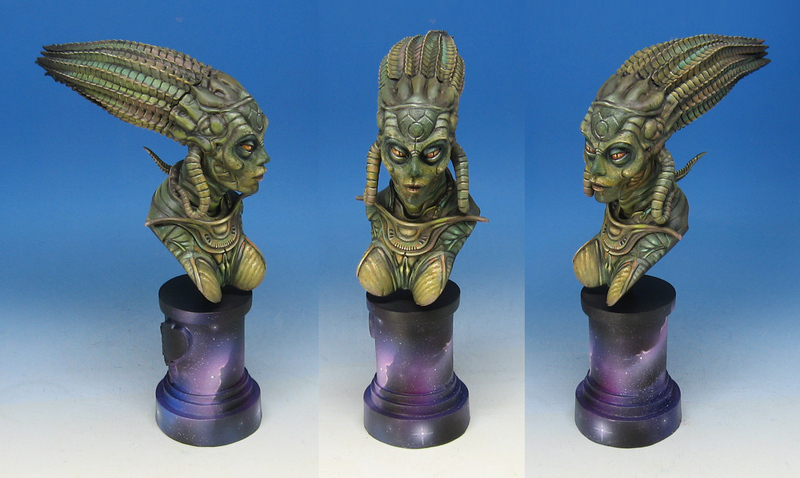 This bust was certainly a great candidate!